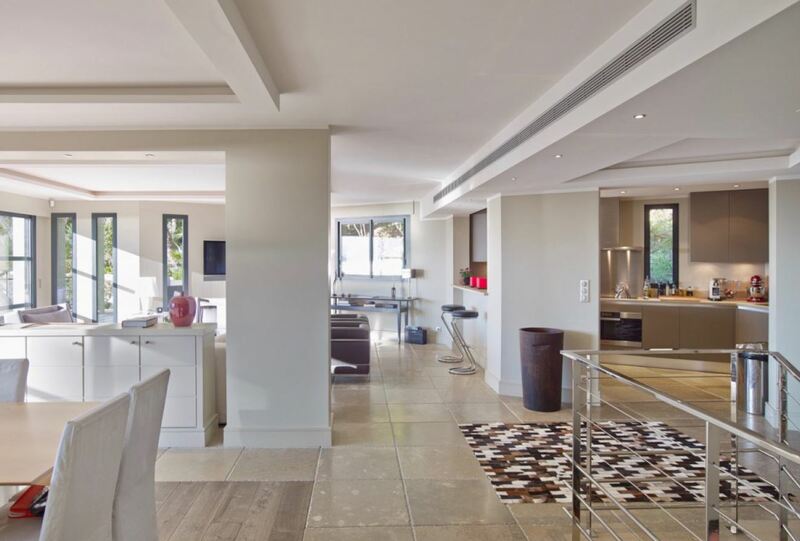 This stunning villa is situated in the hills of Cannes with exceptional views towards the Mediterranean Sea. The property boasts its own private swimming pool and pool house as well as a petanque space. The entrance to the villa is situated on the upper level and opens onto a spacious and bright living/dining area. The interiors are of a contemporary and open plan design to allow for maximum space and light. The sumptuous sofas and chairs are made for 7 people surrounding the flat screen television and a dining table for 8 people. The living areas have a clear view of the garden. The modern kitchen is fully equipped with the latest appliances including a professional oven and a Nespresso coffee machine. The kitchen is completely open to the living and dining areas. The master bedroom is found on the upper level and features a plush double bed and access to the terrace. An elegant en-suite bathroom accompanies it. The lower level of the villa is where guests will find the additional 3 guest bedrooms, all with direct access to the garden and an en-suite shower room. The villa features its own wine cellar on this level of the property. The outdoor space of the villa is where guests can make the most of the glorious sunshine with the large swimming pool with an outdoor shower. The pool house contains a kitchen and a summer dining area where sunsets can be admired during al-fresco meal times.